FERRARA, Italy -- How do animals that have evolved for millions of years underground, completely isolated from the day-night cycle, still "know" what time it is? Does a normal circadian clock persist during evolution under constant darkness? A new study directly tackles these fundamental questions by investigating a species of cavefish, Phreatichthys andruzzii, which has lived isolated for 2 million years beneath the Somalian desert. Many fish species have evolved in the absence of sunlight in cave systems around the world, sharing a common set of striking adaptations including eye loss. The new study, published September 6 in the online, open access journal PLoS Biology, reports that this cavefish has an unusual circadian clock; it ticks with an extremely long period (up to 47 hours), and is completely blind. The circadian clock is a highly conserved physiological timing mechanism that allows organisms to anticipate and adapt to the day-night cycle. Since it ticks with a period that is not precisely 24 hours, it is vital that it is reset on a daily basis by signals such as light to ensure that it remains synchronized with the day-night cycle. The molecular mechanisms whereby light regulates the clock remain poorly understood. Fish have emerged as useful models to study how light regulates the clock since in most of their tissues, direct light exposure resets the clock. This differs from the situation in mammals, where light regulates the clock only indirectly through the eyes. However, the identity of the photoreceptors that must be widely expressed in fish tissues has remained a mystery. 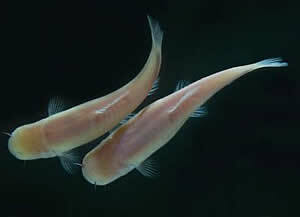 "Cavefish give us a unique opportunity to understand how profoundly sunlight has influenced our evolution," explains Cristiano Bertolucci, co-author of the study. The authors' starting point was to compare the circadian clock of the blind, Somalian cavefish with that of a "normal" fish � the zebrafish. They studied the locomotor activity and clock gene expression in both species when they were exposed to a light-dark cycle. While they obtained evidence for a robust circadian clock in the zebrafish that was synchronized with the light cycle, no rhythmicity was detected in the cavefish. However, in a comparable study where both fish were exposed to an alternative timing signal, a regular feeding time, both zebrafish and cavefish displayed circadian clock rhythmicity. Thus, they concluded that the cavefish still has a clock that can be regulated by feeding behavior, but which cannot be reset by light. In a more detailed study, they were able to show that the cavefish retains a clock that ticks with an abnormally long period. Strikingly, they also found that the lack of its resetting by light is not due to eye loss in this fish; instead, mutations in two widely expressed opsin photoreceptors leave the clocks in most tissues unable to respond to light. "This work holds great importance for two major fields of interest," explains Nicholas Foulkes, another co-author of the study. "First, it provides a fascinating new insight into how evolution in constant darkness affects animal physiology. While most detailed molecular studies of cavefish have focused on the mechanisms underlying eye loss, very little is known about other, broader adaptations to life without sunlight. Second, this work provides the first genetic evidence for the identity of the widely expressed photoreceptors in fish. This study sets the stage for a more complete understanding of how clocks respond to their environment." Men in Black comes to mind: Jay: Zed, don't you guys ever get any sleep around here? Zed: The twins keep us on Centaurian time, standard thirty-seven hour day. Give it a few months. You'll get used to it... or you'll have a psychotic episode.